The assignment will be graded according to the criterion referenced assessment sheet included with the assignment questions. You should review this document carefully. Students are encouraged to grade their own work against the criteria sheet in order to identify areas for improvement. For case study problems like those presented in the assignment, marks are generally awarded on the basis of your identification/discussion/analysis of all relevant issues with arguments logically constructed leading to supportable conclusions. 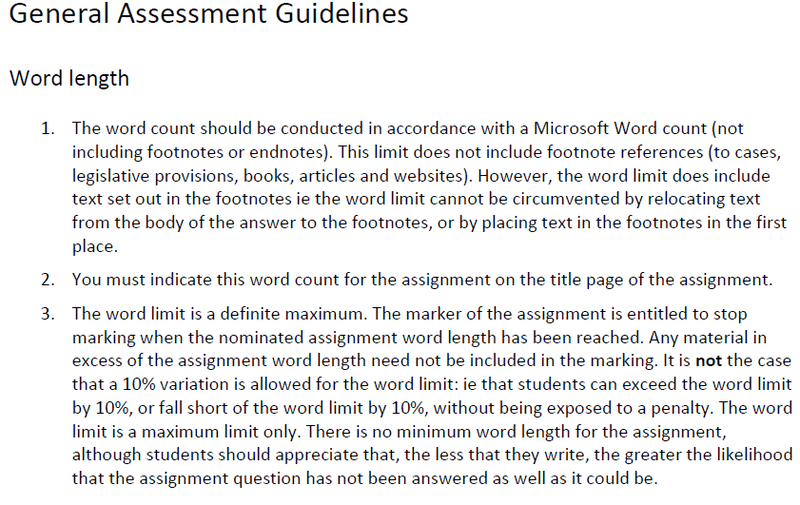 You will not be specifically penalized for reaching a different conclusion to the conclusion that may appear in the suggested solution to the assignment. The most important thing is to raise the relevant issues, identify the appropriate principles of law or authority, apply these principles to the facts and come to a logical conclusion on the basis of your analysis and discussion. We expect that you will use appropriate reference to authorities in your discussion. Where calculations are involved you will receive marks on the basis of your calculations and part marks will be awarded where only part of the calculation is correct. In completing your assignment you must distinguish between relevant and irrelevant material and edit the latter from your answer. An answer or an advice to a client which only contains relevant material convinces the marker or client that the author is sufficiently knowledgeable of the subject to be able to exclude irrelevant considerations and material.  Commence work on your assignment, well in advance of the due date. I suggest you read the assignment prior to commencing your study of the course. While you may not have covered all the relevant material to answer all the assignment at that stage an awareness of the issues raised in these assessment items will assist you in focusing your study.  Answer the questions set and only the questions set. Do not introduce irrelevancies or matters which are at best marginally relevant.  Do not paraphrase legislation, quote if it is critical for your argument otherwise say why it applies.  There will usually be some specific section(s) of the Act relevant to the problem/issue, these should be cited correctly when answering any question. The same applies to cases and taxation rulings. Again, it is a fine line between making all necessary references and going too far. Practice is the only solution.  Only cite the facts of a case if you wish to distinguish it. If you do not wish to distinguish the case refer to the principle established by the case and put the name of a relevant case in parentheses ( ) after referring to the relevant principle. It may disrupt the flow of your analysis or problem solving exercise to digress into a discussion of the facts of a particular case.  After typing the assignment always edit the work.  You must be able to prove you have submitted an assignment so ensure that you retain evidence of submitting it for example your confirmation email. over the semester as the case studies are designed to enable you to complete once you have finalised your study of part of the course. Plan your time well and you are unlikely to run into problems with being late. In written work, citations or footnotes in the text are used to inform your reader of the source of your information. Direct quotations are always cited. Not only is this a courtesy to the original author, it would be considered plagiarism if you failed to do so. If you are enrolled in the Bachelor of Laws or Juris Doctor program, you must use the Australian Guide to Legal Citation (AGLC) when referencing in your law courses. If you are studying a law course that is not part of a law degree, for example as an elective or as a Business or Commerce student, you may use either the Australian Guide to Legal Citation or Harvard AGPS Style. Whatever style you choose, you must be consistent in your approach. To help you get started have a look at the presentation Referencing with the Australian Guide to Legal Citation and the Overview of Australian Guide to Legal Citation table. Below are some specific tips and examples of good and poor approaches to case studies and problem solving in taxation. Issue State the specific issue. These examples are more specific and allow you to find the correct area of law more quickly. Only list the law most relevant to the facts. If you are not going to apply a case in your application, then don’t list it here. For example, if your issue is about repairs and the specific issue is whether it is an improvement, you don’t need to apply cases about initial repairs or replacement of entirety as these aren’t relevant. You must apply the cases and legislation you have listed above to the facts in your scenario. In the facts, the taxpayer paid an amount of…..this is similar to the case of ….where the court held that…. In the case of……the court held that …..because the taxpayer in that case….. In these facts the taxpayer has also…..therefore the decision in the case would be relevant.  Please DO NOT cite the Study Book or Solutions book in your application. The idea of this assignment is that you are applying case law and legislation in your own words to the facts. If you have used a solution or the study book to gain a better understanding of an issue, that’s fine, but you application to the facts should always be in your own words! Restate your issue and answer the question you stated in the issue. Your conclusion must be consistent with what you have argued in your application, otherwise it will not make sense. For example if you have used cases in your application which suggest an amount is assessable, your conclusion must state this.